SACS - Safety Access Control System. Powered Access Equipment. Specifically designed to regulate usage, enhance control & limit your liability. 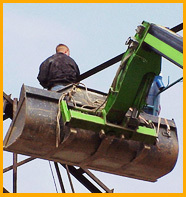 ACCESS only authorised & qualified personnel operate your access equipment - no unauthorised use. NO EXPOSURE to damage and repair or third party liability claims from out of hours or weekend freebie unauthorised working of your machines. FLEXIBILITY by digital Keypad PIN Code Controls via sms text or internet pay as you go billing, from the comfort of your office. You regulate the usage, reduce your costs and improve your profits. PAY BACK You regulate the usage, reduce your costs and improve your profits. under the 2007 Health & Safety CD&M Regulations & under the Corporate Manslaughter Act. Tracker systems will not stop the un-authorised use of machines.